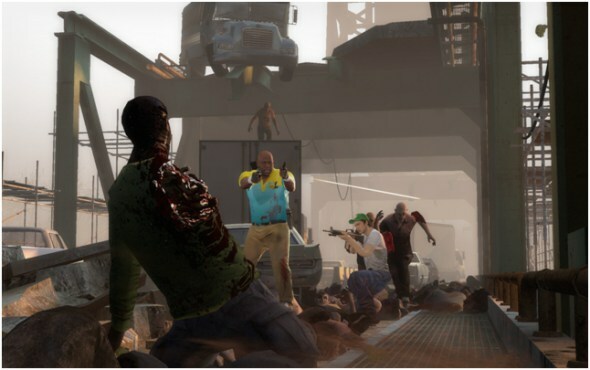 There isn’t much that could have been done to make Left for Dead 2 completely different from the first Left 4 Dead game, but why would you want to change it? Hordes of Zombies! Exploding heads! High probability of death! And a frying pan! What’s not to like? This is just one of those games where you can just sit back and let loose. There’s no puzzles to be solved, just get from point A to point B whilst killing as many of the undead horde as you possibly can. This time around you’ll have four more survivors to choose from in Ellis, Rochelle, Nick and Coach. It doesn’t matter who you choose as there are no pros or cons to any of them and they all play the same and can carry the same weapons. Of course the melee weapons are in there and the chainsaw is just too much fun not to use. Zombies running straight at you and the sound of powering it up and cutting them to shreds and watching their body parts fly. There’s something quite disturbing about how much I like it! You’ve also got things like electric guitars, cricket bats, frying pan as well as a couple of others. The good thing about buying Left 4 Dead 2 on the PC is that I got the ‘The Passing’ downloadable content add-on campaign for free, unlike the unlucky Xbox 360 players who had to pay for it. It’s not a massive campaign, but still good fun and was good to see the survivors from the original L4D make an appearance. They do end up getting involved and help you out near the end to fend off the hordes. There are some new additions to the special infected including a ‘Charger’ who has a giant arm and runs straight for whoever it fancies and charges them into the closest thing to ram you into. It’s then up the other team members to bring it down before doing serious damage. Another is the ‘Spitter’ who if not killed in time, will spit toxic goo at you, and if you stay stood in it, you’re health will decrease…quickly, so avoid it and kill them straight away. The other addition is the ‘Jockey’ which you can hear coming for you before you can see them with their mischievous laughs. If it gets hold of you before you kill it, it’ll ride you like Seabiscuit until your team bring it down whilst it’s on your back, and I’ve found them to be right little pesky critters! There’s also the inclusion of adrenaline shots, which will help you to move a lot faster to get through hordes and to the safety room, if that’s what you want to do. I generally prefer to stay and fight and blow off as many heads as possible. It’s much more fun that way. The gameplay is exactly the same as the original so you won’t have any difficulties jumping into the game and get going from the off. I prefer to play FPS on the PC as I find the mouse to be a lot more accurate to use and it’s easier to control the hordes pouring in at you from every angle, compared with using a joypad, similar to how Zath found playing Call of Duty: World at War and Grand Theft Auto 4 on PC. For the most part your team’s AI is pretty good, but there has been times when I’ve been caught by a smoker and they just stand there admiring the corpse strewn scenery, which can get annoying when the end is in sight. The four player Co-Op is great fun! It can be a little bit tricky with some parts of the game as you all tend to go a bit trigger happy and venture off, not staying together as a team like your meant to. 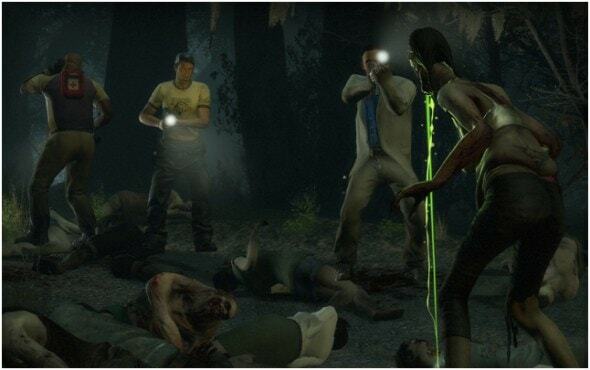 The last part of the mall mission was really tricky as there seemed to be a hell of a lot more of the infected coming for you, but we found a way around it and we felt like we’d accomplished something when we’d finished it. Simple things. Headsets would definitely help in certain situations so you can co-ordinate how you’re going to progress through the game. 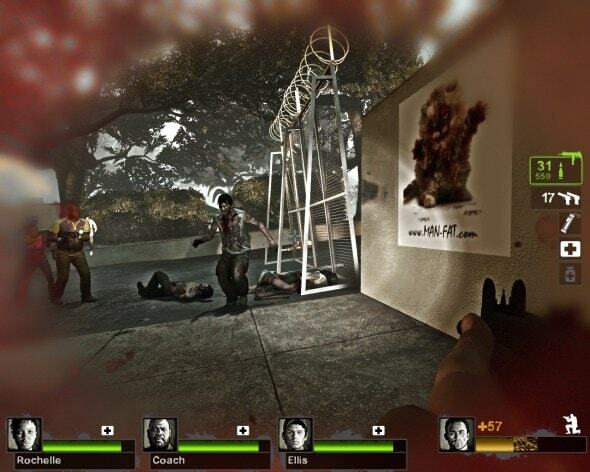 The graphics on Left 4 Dead 2 are superb and you can see how games are being pushed more and more towards photo realism. There’s been times when all that’s left on screen in a mass of dismembered bodies at your feet and it’s quite sick just how real and slimy the body parts seem. The physics of how the infected fall is brilliant and it’s satisfying when you can see the remnants of a head you’ve just smeared on the wall from your shotgun (I swear I don’t need help. It’s just fun killing Zombies). You can add film grain or take it off, whichever way you’re inclined. I prefer to keep this on as it makes the game feel and bit grittier and adds to the atmosphere. 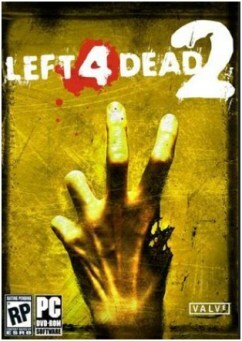 I thought that the first one was great fun and a refreshing take on the whole Zombie shooting games. Left 4 Dead 2 doesn’t have anything that’s massively different, but there should still be enough in there to keep you happy for another few hours of anger management class. Whether you’ve played the original or not, this is definitely one to add to your list.